There's value in knowing the source of your food. 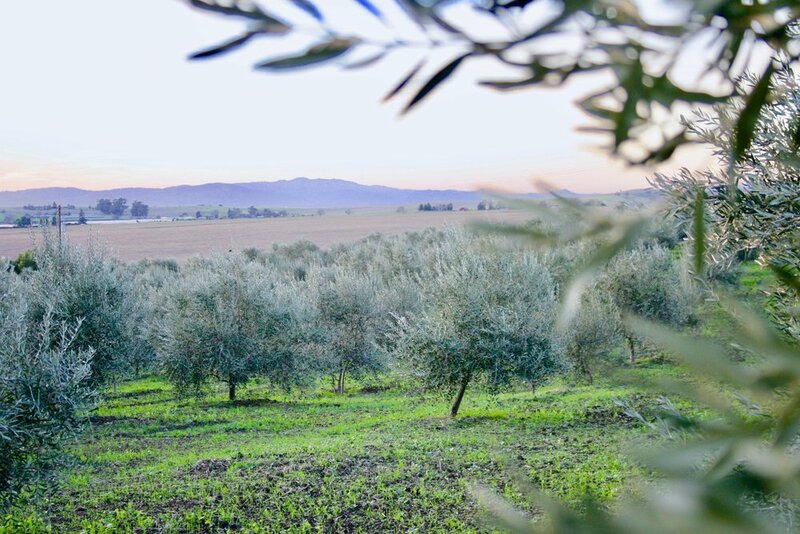 We are a (very) small farm in Hollister, CA, producing an Italian, pasture-blended oil. We believe what differentiates our oil from others is our harvesting process. Our olives are hand-picked, sorted, and crushed at one of the last stone mills in California, using granite stones brought over from Italy. Tuscan varietals: Frantoio, Luccino, Pendolino, Maurino, and Taggiasca. Typically, we harvest later than most. Earlier harvesting produces a nutrient-dense oil higher in polyphenols (peppery), while a later harvest yields a more mellow flavor. Additionally, we allow our oil to “rest” for several months instead of bottling it immediately for quick sale. We are patient and painstaking. It is both an art and a science to determine exactly when to harvest each year to produce an oil that is buttery but with a peppery finish, an oil high in nutrients but high in flavor, as well. Extra Virgin means the olives are crushed once, then discarded and there is nothing added to the oil. In our "rush to crush," we crush within 24 hours of harvest to preserve nutrients and to maximize flavor. It's definitely a family affair. Grandparents, neighbors, children, nieces and nephews, all lend a hand when it's harvest time. From ages 4 to 89, it's "all-hands-on-deck"... everyone pitches in to get our product off the trees, into bins, and to the pressing. It's a very hectic few weeks of the year - and to achieve that mild, buttery flavor, we harvest LATE, usually the end of November or early December. Not a very busy time of the year for a large project like this, really. Not at all. Our oil is cold-pressed because heat degrades polyphenic nutrients. Our oil is certified organic, hand-picked, and pressed the Old-World way. Painstakingly crafted, we allow the oil to rest for a minimum of 60 days to allow the oil to full separation from the sediment which sifts to the bottom of the barrel. Stored at a cool temperature, the oil is then hand bottled. You will be able to taste the difference and will be amazed at just how good fresh tastes! We ensure that Bella Vista olives are the very first crush of the day at one of the last stone mills in California. Pictured at the right is a frantoio crushing olives using the preferred milling method used for centuries (minus the donkeys).